So to the first tournament of this new decade, where Ireland are the current champions, and finally managed to win that second Grand Slam, which has eluded them since 1948. The rest of the group have all had varying degrees of success in the autumn internationals, with Scotland surprising everyone by beating Australia. However push past form aside for now, the real battle starts here. Definite favourites to retain their Six Nations title this year, Declan Kidney has kept his core side intact while bringing younger players through over the summer and autumn, such as Leinster’s Jonny Sexton, who will be major competition for the number 10 jersey against Ronan O’Gara (pictured below) this year. It’s great to see Rory Best back in contention for the front row following a serious neck injury. Ireland’s side is the only one that really picks itself, which shows how settled they are in that similar vein of that dominant England side of the early noughties. The likes of Rob Kearney, Tommy Bowe and Jamie Heaslip have had their reputations enhanced by success in South Africa with the Lions last year, let’s see if they can perform with that added pressure and attention. Martin Johnson has hailed his recently announced England Elite Player Squad as the best that he has had since he took over the reins from Brian Ashton. Whether its mind games to his squad and the press but this side has to perform this year. After up and down performances last year it’s about time that England settled down in their combinations and worked with them, like the side that was so successful with Johnson as captain. Once again their game will centre on a resurgent Jonny Wilkinson, who needs to improve his kicking out of hand after the autumn games, while the likes of Lewis Moody need to cut down on the errors at the break down. The return of the rolling maul should suit England’s game, providing good ball for the backs to use and be creative with. I’d like to see Matt Tait (pictured above) of Sale starting at outside centre, complemented by Rikki Flutey, a contrasting pair who could make lots of progression in making the most of the backs. Also keep an eye out for Ben Youngs, the Leicester scrum half is set to make an impact on the England side sooner than later. Wales are the side that pushed Ireland right to the edge in their clash last season and this season’s is set to be just as competitive. Despite having won the Grand Slam in 2005 and 2008, they are still not seen as one of the main challengers, unlike Ireland and France. But I think they like the tag of being the dark horses, they like to surprise you. The first match up at Twickenham will be tough but they have had the better of their old enemy in previous years so this side will not be daunted by it at all. 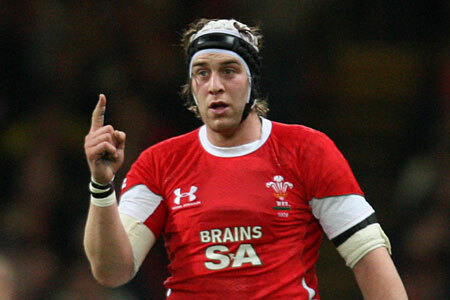 Lead by the strong and efficient Ryan Jones (pictured above), their pack is solid while their backs contain the creativity with James Hook at the helm, sending relatively tiny backs in today’s terms Shane Williams and Leigh Halfpenny down the wings while also having the defence crashing Jamie Roberts in the centre. We saw signs of Scotland coming together as a unit over the autumn, their victory over Australia as much of a credit to their defensive skills and true grit as well as Matt Giteau’s dodgy radar with the boot. 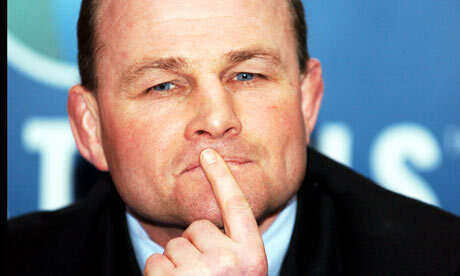 Under new coach Andy Robinson we will either see a progressive Scotland or the same Scotland of old, hopefully the former. Scotland will use this year’s tournament to see how they’re continuing to improve under Robinson, who has learned lots since his term as England Head Coach in 2004. Forward and backs working in unity, as well as unity in selection will be key as they do have quality players such as Ross Ford, Phil Godman and the Lamont brothers who have the potential to be the shining lights for the side this year. The main question for this year is “Which France side will turn up?” They have always been a Jekyll and Hyde side: Grand Slam seasons have been followed by mediocrity has warranted frustration from the fans and media. 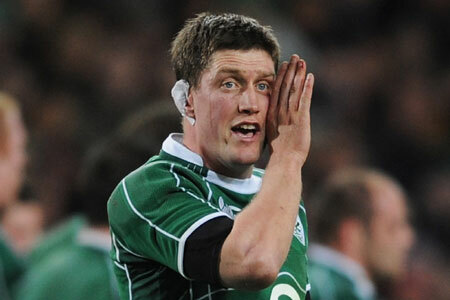 Yet their strength in the Heineken Cup, particularly with the dominance of Toulouse has shown in their side. Despite losing Damien Traille through injury and the talented Julian Dupuy, who is serving a 6 month ban for gouging, France can still name talents such as Sebastien Chabal (pictured below), Imanol Harinordoquy, Jannick Jauzion and Vincent Clerc, who will be sure not to repeat last year’s 3rd place once again. The new boys, celebrating 10 years of being wooden spoon contenders. With the other sides having progressed through the autumn it would be great to see the Italians push forward in their second decade. It is the usual thing for them to beat Scotland in Rome but away trips to Dublin, Cardiff and Paris may prove too much for them once more. Saying that if a shock is to happen somewhere, it will probably be at the Millennium Stadium, where Italy have previously drawn against the Welsh in this tournament. With many of their players plying their trade in the French and English leagues, such as Martin Castrogiovanni (pictured below) being a fans favourite at Leicester, they do have the players to do well, it’s just the will and confidence to win that they need more of. My prediction for the title is Ireland, as they’re a settled side capable of beating anyone at the moment, but I expect them to be pushed close for it by the likes of France and Wales, and possibly even England. Scotland and Italy to fight it out for the wooden spoon, but if the Scots can show the form, style and grit that they showed in the autumn then they could beat anyone on their day.